To go along with the scope and sequence I have been working on designing activities to reinforce the concept. For the month of August I have designed Snaky Ss Activity Pack and Marvelous Mm Activity Pack. Game 1: Find the picture that is the same. Game 2: Put together letter S puzzles. Game 3: Build the letter S out of playdough. Game 4: Find and circle the letter Ss. Game 5: Practice writing the upper and lowercase letter Ss. Game 6: Read! Make! Write! Letter S Words. Game 7: Letter S Lacing to the Number 5. Game 8: Build the letter S out of pattern blocks. 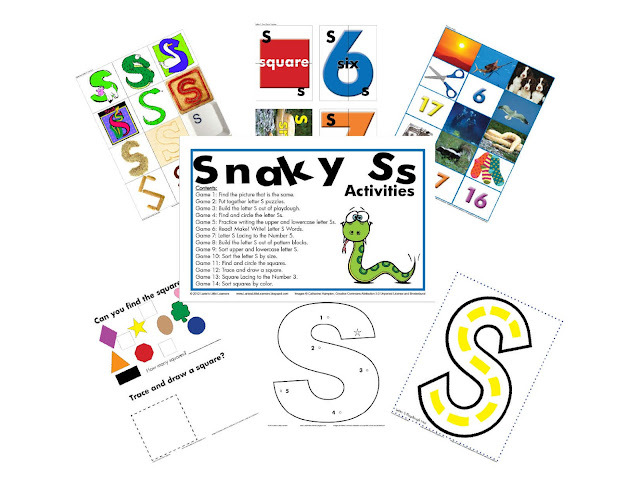 Game 9: Sort upper and lowercase letter S.
Game 10: Sort the letter S by size. Game 11: Find and circle the squares. Game 12: Trace and draw a square. Game 13: Square Lacing to the Number 3. Game 14: Sort squares by color. This file might take some time to download because of its size. I have the Marvelous Mm Activity Pack designed. I am working on putting all the individual pieces together into one downloaded packages. Stay tuned for more updates.